I have found numerous posts (in this forum and elsewhere) on how to do this for files but I can't find a way to do it for whole folders. As Paweł Karpiński said, use the -R option to apply the rights for all files inside of a directory too. As enzotib mentioned, you need to use sudo to change the ownership from root to yourself. Note that if you use chown <user>: <file> (Note the left-out group), it will use the default group for that user. Since ./blabla owned by root you need to gain root privileges to change that. That's what sudo will do. The -R option for the chown command says: this directory and everything in it recursively. First chmod -R can mess up your system permissions if you do it on system file and directories by mistake. Second chmod -R can mess up flags in those folders and is not a good idea to give permissions on some folders to all the users. Not the answer you're looking for? Browse other questions tagged command-line permissions folder or ask your own question. How do I get full permission to my files? 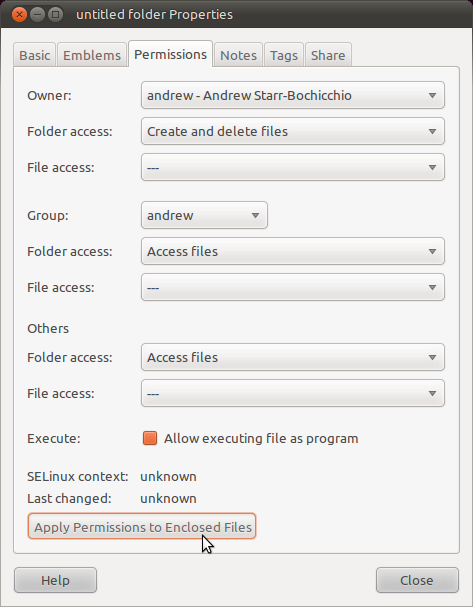 how do I make my profile's folders and files private from other profiles on the same PC running Ubuntu 14.10?